Look everyone, we now have a legends and lore trailer for the upcoming multi-platform RPG Elysian Shadows. As you would expect from the title, the trailer delves deep into the world and mythology of the game. While it doesn’t really show much gameplay, there’s a ton of screenshots and samples of the game’s soundtrack. We have not done a news story on Elysian Shadows since its Kickstarter campaign was announced back in August 2014 (I suggest you check the link out, if you are not up to speed on this ambitious project). The game was successfully funded within weeks of the crowd funding campaign going online and caused quite the media stir. Including an appearance by Falco, Tyler, Patryk and Connor on SEGA Nerdcast 55, where Connor gave us an exclusive sneak peak of his boss theme, followed by another appearance on Nerdcast 59 featuring more of Falco than one would want to see. It was originally given a tentative release date of December 2015; however, it doesn’t appear the game will be releasing anytime soon. 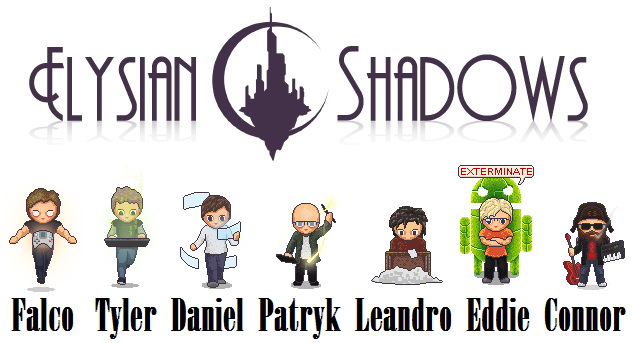 Unlike other crowdfunded games or indie Dreamcast projects where developers simply underestimate the challenges of game development, the Elysian Shadows team had to deal with … well, not having a team. With the exception of programmer and project creator Falco Girgis and Poland-based artist Patryk Kowalik, all the original seven developers pictured above left the team. Falco and Patryk were the only two members still in the team. While the duo kept working on the game, the big news coming out of the studio consisted of all the drama that had lead to the dissolution of the team. Ironically, former members of the team started developing Towards the Pantheon, which looks like it’s really far in development and should be coming out in Fall 2017. The project is spear headed by Canada-based musician Connor Linning and Russia-based artist Leandro Tokareveski. Tyler Rogers and Daniel Tindall are also credited. Connor informed us that unlike Elysian Shadows, which relies on an engine the Elysian Shadows Team developed themselves, he is simply using GameMaker Studio to develop Towards the Pantheon, which makes a Dreamcast port difficult. Nonetheless, the game is looking great with his signature music and fervent desire to integrate survival horror elements into an RPG. Circling back to Elysian Shadows, the project team had experimented with a few developers and have now finally settled down with brothers Jeremy and Brandon Likes. Both of whom were backers of the project, with Jeremy serving as sound engineer and Brandon handling community management, level design and video production.